The Health Water Taxi Has Now Arrived on Lake Kivu! Idjwi Island is a peaceful yet impoverished island in the Democratic Republic of Congo. There is minimal access to health care on Idjwi, resulting in one of the highest maternal and infant mortality rates in the world. 1 in 6 children die before their first birthday. During her teen years, Dr. Edwige Mubonzi lived for a time on Idjwi Island. She was deeply moved by the malnutrition of children and the lack of health care she and her family witnessed. At age 14, she vowed to become a doctor to be able to help those on Idjwi Island. Her father, supporting her dream, gave her a small plot of land upon which to build the clinic. Current island leaders, well-known to Dr. Mubonzi and her family, are committed to building a hospital with special programs for women and children. Mwendo Congo shares and supports this vision. Land for the hospital (a plot adjacent to Dr. Edwige's gifted plot) has been purchased with the support of Mwendo Congo, and cleared by the islanders. We are blessed to partner with a team of highly skilled, strategic and compassionate leaders in the DRC who have recently formed a Congolese non-profit organization called the Idjwi Initiative. Like Mwendo Congo, the Idjwi Initiative is a group of volunteers committed to using best organizational practices to realize our vision. In October 2015, the Health Working Group of Mwendo Congo made a commitment to support the plan of our Congolese partners, Idjwi Initiative, to purchase a health water taxi. After twenty months of dedicated work by both organizations, along with Minnesotan and Congolese Rotary Clubs, the financing of this life-saving project was completed in June with a $31,500 grant from Mwendo Congo to Idjwi Initiative. Thank you! In March, 2018 the health water taxi arrived in Bukavu (traveling on sea and over land from Dubai!) and in June, 2018 was fully licensed and began service on Lake Kivu. Individuals and local NGOs are encouraged to contact Idjwi Initiative via Facebook for schedule information and to book trips. The boat is also available for rental for private family and business events. All profits of the water taxi operation support the work of Idjwi Initiative. The boat also operates one day per week to transport pregnant women of South Idjwi Island to medical facilities for skilled attention during, and after, the delivery of their babies. 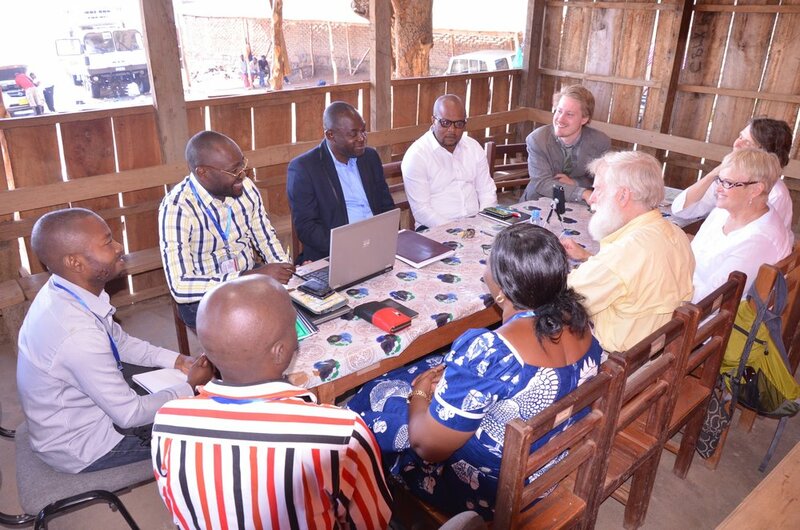 Members of Mwendo Congo meeting with members of Idjwi Initiative. Bukavu, June 2016.